Compared to what we have from where I come from (the Philippines), everything in America is super-sized, or is geared to being one. And I mean, everything! That includes houses, cars, buildings, clothes, furniture, grocery items, fast food items and all things you can think of. I believe this is one of the results of a free enterprise. Competition is tough, that’s why every company there is has to fight tooth and nail to get their market. And how? Well, by catering to one of human nature’s weakness -greed – and sending messages that inculcate within us “the bigger, the better” mentality. But I have to say though, in fairness, that this mentality is NOT unique to America. It’s happening all over the world, wherever free enterprise thrives. But you know what, in other places such as the Philippines, their concept of “BIG” is definitely not the same as what’s considered as such here. Relatively, food portions / servings in America are also huge. That’s why eating in a restaurant is always an experience to me..everytime. I never stopped being amazed at the portions the customer gets! It’s humongous! I’m telling you, one serving they give you here can already feed two Filipinos, at least. I am not kidding. So when Mr. J came to the Philippines, it was also the reverse experience for him. The servings are much smaller back in my homeland, comparable almost to a kiddie portion here. Imagine my hubby’s surprise when we ate at a local pizza place in Cebu (the city where I come from) …. we ordered a large pizza, and what came was the size of a round 8″ plate. He looked at the pizza and at me in confusion and said, “that’s it? This is personal size!” Yep, that’s the size of the large pizza in the Philippines. One gets a much smaller small portion there, commensurate to the Filipino’s tiny frames, maybe? Why am I talking about this? Well, because the dish I have for you today is actually something meant for a smaller portion – it was originally an appetizer in a popular restaurant. This dish was without the pasta; just the saucy shrimps and scallops served with bread so we can dip it, and soak up all that wonderful goodness in a bite. I like it so much that I decided to experiment to try to re-create it, and turn it into a main course by adding pasta. So, here it is. I am also sending this dish out as my entry to Presto Pasta Nights being hosted by Gay of A Scientist In the Kitchen. 1. In a pot bring water to boil. Add pasta and cook till al dente. 2. In the meantime,heat butter and olive oil in a saute pan. Add garlic and green onions. Saute until the aroma fills the air. 3. Add kalamata olives and sundried tomatoes – cook for 30 seconds. 4. Add shrimp and scallops, salt and pepper to taste. Cook until firm. Do not overcook. Remove shellfish from pan but keep warm. 5. Add chicken broth, white wine and bring to a simmer. Reduce until half the amount. 6. Return shellfish to pan. Add the pasta. Mix well. 7. Add the lemon juice, feta cheese and parsley. 8. Remove from heat. Serve garnished with torn basil and more feta cheese, if preferred. NOTE: The measurements I have given you for the spices are all in estimates, as I was eyeballing everything. Pls. feel free to reduce or increase the amounts, according to your preference. We had this dish the other night but I just wanted to post it here. I’d been planning to try this recipe from Rachel Ray for days. 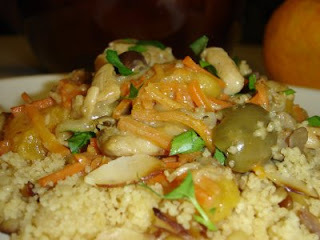 It is a knock-off of the Morrocan chicken tagine. You might not like this dish if you’ve not tried Middle-eastern, Mediterranean or Arabic food before. This dish has so many contrasting flavors going on such as the sweetness from the dried fruit, the tanginess from the olives, the spices from cumin, ground coriander, cinnamon and smoked paprika. Your first bite might seem strange but as the flavors marry in your mouth, the food actually tastes better. I served the dish on a bed of couscous (ground semolina pasta, a staple of North African /Middle Eastern countries) as the recipe suggested. If you want to try this recipe, check it out here. The only change I made is adding a pinch of red pepper flakes for a little heat. I used apricots for the dried fruit because I wanted a mild flavor. But on hindsight I think that dates would have added a much better flavor. Or maybe, a mix of both dates and apricots would be a nice balance. Oh well, next time. 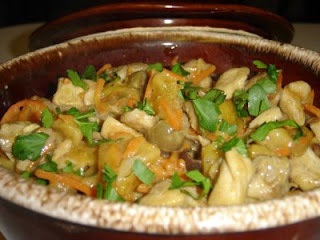 I’ve been planning to try this recipe from Rachel Ray which is a knock-off of the Morrocan chicken tagine. I bought the dry ingredients last week but never had the time to cook. As you can see, tonight’s the night. I did it! You might not like this dish if you’ve not tried Middle-eastern, Mediterranean or Arabic food before. 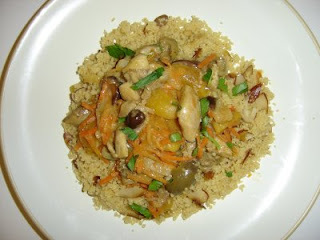 This dish has so many contrasting flavors going on such as the sweetness from the dried fruit, the tanginess from the olives, the spices from cumin, ground coriander, cinnamon and smoked paprika. Your first bite might seem strange but as the flavors marry in your mouth, the food actually tastes better. I served the dish on a bed of couscous (ground semolina pasta, a staple of North African /Middle Eastern countries) as the recipe suggested. If you want to try this recipe, check this link — middle eastern chicken. The only change I made is adding a pinch of red pepper flakes for a little kick. I used apricots for the dried fruit because I wanted a mild flavor. But I think that dates would have added a much better flavor. Or maybe, a mix of both dates and apricots would be a nice balance.